After i explained how to disable the auto generation of certificates in this post, i now want to explain how to replace an certificate manually. 4. 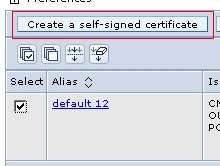 Select the default certificate and click "Create a self-signed certificate"
7. Select default and click "Replace"
8. You can now choose which certificate will replace the old certificate, normally its the newly created one. Do not select "Delete old certificate after replacement" and "Delete old signers". I like this procedure, but my preference is to just Install SSL Certificate instead of replacing or renewing current ones as this seems a far easier technique for me and the list of sites I serve.